Now here’s an episode that seems to fit the stereotype into which MLP:FiM is often tossed by those who have not seen the show: ponies being all fussy over what dresses they should wear to a big fancy ball hosted by a pretty pretty princess, and then holding a fashion show to show them off to the town. YAWN CITY, right? While I was quite enamored with this show when I got to this episode for the first time oh so many years ago and knew full well its track record of being able to take boring-sounding topics and make them oh-so-enjoyable to watch, I was still slightly worried that this one would be, in the words of Applejack, “too froufrou-y.” It also didn’t help that I had not yet really warmed up to Rarity by this point, so that this also appeared to be a Rarity-centric episode was really not helping to favorably position this on my Want-to-Watch-o-Meter. But let me tell you, I was quite pleasantly surprised at how the episode turned out. I’m just going to cut right to song here. The “Art of the Dress” song lands somewhere between the #1 and #2 categories that I described in Friendship is Magic, part 2. The first time I got through the initial segment I found myself wearing a “seriously, a song about making dresses?” face, but by the time the second half finished up that was replaced by a genuine smile. The song’s perpetually upbeat melody belies the complex emotions that the lyrics stitch together: the love and ingenuity that go into activities one is passionate about becoming usurped by the constraints of reality and the demands of the customer. While this grim message will likely be lost on the “target demographic” of the show, it’s delivered with a toe-tapping melody that is sure to please nonetheless. “Art of the Dress” is one of the few MLP:FiM songs that I would listen to in its original (read: non-remixed) form in the car for a good long while. It’s not quite as iconic as “Winter Wrap Up,” but it’s masterful in its own right. You don’t need to change a thing about this one, Rarity: this song helped me to finally understand you, to finally “get” where you were coming from with your fashion obsession, to finally appreciate you as a character. And I wouldn’t have it any other way. Unfortunately for Rarity, everypony else would rather it another way. Well, at least as far as their dresses go, anyhow. I suppose I could see Twilight being super-OCD about making her dress technically accurate (despite her initial plan to wear something decidedly not technically accurate to the Grand Galloping Gala), but AJ with her duds and Rainbow with whatever this is? Whew, harsh. (Tangent: Rainbow Dash literally “drops in” through the roof and Rarity’s first reaction is “I’ll make you a dress!” rather than “MY STORE!” Is it because she’s just so in the zone it’s ridiculous, or that repairing structural damage isn’t really a big issue when you’re a unicorn? With the amount of damage that RD causes with her flying in this series, I’m beginning to think explanation #2 is just about as valid as #1.) After the way everypony reacts to Rarity’s generosity, I don’t blame her for losing it the way she did (after gallantly not losing it for so long, at that). 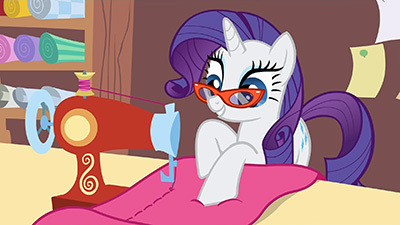 Tabitha St. Germain (who voices Rarity) is one of my favorite voice actresses in the show, in no small part due to the way she’s able to portray all the different ways that Rarity goes bonkers… of which there are many. The way she voiced Rarity’s breakdown scene in this episode was just tragically wonderful. And poor Fluttershy. 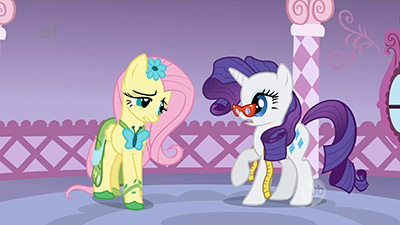 While her vision of her own dress turned out to be just as ludicrous as everypony else’s, it’s clear she had the technical expertise to know how to improve upon Rarity’s initial design (as opposed to, say, “It needs to be about 20% cooler.” Which, by the way, is one of those phrases that exploded into a meme for who knows what reason… not that I’m complaining, though!). However, her extreme meekness and Rarity’s utter frazzledness at the time came together in a perfect storm of awkwardness for both ponies. What a shame, too, because had they been able to work together they probably could have made Fluttershy’s dress even more marvelous than it was by the end. But those who allow the artist to do what he or she does best? Well, those lucky few wind up with something marvelous. I’ve got two songs for you this time: the first is Art of Dress (Archie Remix) by Archie, which is one of the first remixes I heard of any MLP:FiM music and remains one of my favorites to this day, and the second is Rarity Attempts 400 Dresses (LOOMING MIX) by the amazing Foozogz, which evokes the kind of madness that must accompany a ridiculously huge order with a ridiculously close deadline. If the title of the second one sounds familiar, it’s because I had linked to a similar song for Applebuck Season that provided an equally frantic version of Applejack’s mind while trying to tear through an entire apple orchard by herself. Foozogz puts out some ridiculously great stuff. This episode is a delight, and I love how it goes quickly from Rarity not letting her friends just do their own thing to the almost karmic twist of them piling on so many demands that she doesn’t get to express herself through her art. And I think that’s where the story is missing a final beat, in that I like that the other ponies realize they’ve robbed Rarity of the chance to display her own true work at the fashion show, which is supposed to be about her and a potential furthering of her career, but I think she also needed to back away from her demand on dressing everyone else for the Grand Galloping Gala, because that isn’t about her. That’s about them and every pony being free to represent themselves. Yes, her gowns are perfectly suited to each pony, but it’s still them as seen through the filter of her, and I think alongside the message of “trust the artist to do their art” needed to be a moment of “trust the person to be themselves”. At least she could do what was originally asked of her: just help make some little fixes and mods to what the other ponies have already picked out for themselves. Help them without overriding them, to put it another way. As it is, I’m curious to see if these will be the gowns they ultimately wear to the Gala, or if there’s still going to be another episode addressing this as it grows ever closer. I don’t want the above to sound like a criticism that brigns down the episode, because it’s not. I absolutely love this one. The songs are well used, with great characterization and flow, perfectly evolving from a Disney-esque “this is what I love” to a more frantic “this is what I must do” to the piling of “MUST MUST MUST WHY MUST”. I love that every pony is unique in expressing the issues they have with the costumes, with Twilight’s representational accuracy, Fluttershy’s wonderfully unexpected oppositional views on fashion design and stitch technique, Applejack’s desire for practical application, Pinkie being all Pinkie (love that we get one of those jutting closeup “Huh huh HUH?“), and the nice lull between the demands with Rainbow’s equally frustrating “…. Just make it cooler.” This is good, sharp writing, and at the heart of it all is Rarity, suffering for her art and her clients, all because she just had to speak up when fashion was involved. I agree with Gerf that Tabitha St. Germain is quickly becoming one of my favorites among the cast. Not that Rarity is one of my favorite characters, as she still has a vanity and judgmental nature that keeps tripping her up, but it’s conveyed perfectly by St. Germain, and one of my favorite bits is Rarity at the end of her rope and humiliated, in a slipper and robe on her bed as she flails about wondering what it is she’s supposed to be wallowing in to make her misery complete. Hoity Toity is… well, he’s pretty much your stereotypical fashion judge with his Thurston Howell III voice and polished couture, but he’s used well and serves his role, and I love the design of both fashion shows. 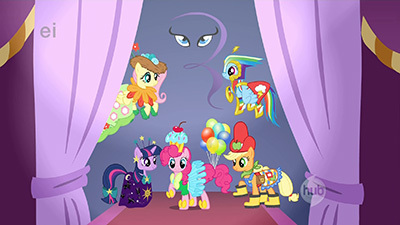 The first one has that great opening of a silhouetted Spike getting into his role as announcer, followed by the horde of dropped jaws as everyone sees the outfits for the first time, then the dawning realization on our Mane Five as they realize how they look (which are actually not bad outfits, just garish in their exaggeration). Then the second one is just gorgeously animated as magic sets the stage for each pony, allowing them to present in ways which are totally them. It’s a very good episode, tightly written and true to character. I still wish it touched on that missing beat, but I don’t mind and enjoyed everything else immensely. I’ve mentioned before that this was the first episode of G4 that I ever saw, and admittedly, it’s an odd one to come in on. 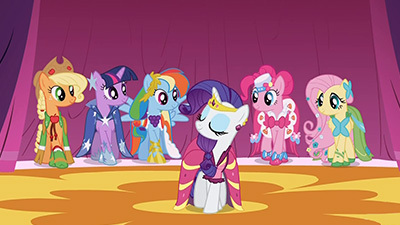 At it’s core, it’s without a doubt the most “Standard Pre-G4 MLP” episode the show ever gets, with the episode not only centering around Rarity making dresses for the others, but with the six deciding to hold a fashion show tossed in there for good measure. The episode is girly as all get out. It’s also very, very good. Lauren Faust at one point in response to a question about the episode premise mentioned that this episode specifically was part of her efforts to drive home the idea that the quality of a show is completely separated from how masculine or feminine it is, and that even the most standard girls’ show plot can be done well and made entertaining. I hear this episode put forward as the one that finally sold people on Rarity as a character, and I can definitely see why. I always liked her from the start, but it’s also possible that this episode being my entry point “pre-sold” me on her. It is here that we get to see a lot more of her past the surface level, which she’s been slightly lacking in up to now. We also get to see her business in action, although it’s hijacked by her project for her friends, it’s nice getting to see her creative energy and drive for beauty made manifest in the workings of her career. The song carries a lot of this episode, taking us perfectly through Rarity’s downward spiral, as she starts happy, enthusiastic, and inspired, and ends frustrated, stressed, and drained. Adagio Dazzle Kazumi Evans does a fantastic job with the song, and it catapults Rarity up to the top end of characters with awesome solo songs. While Pinkie’s songs have been a lot of fun, Rarity’s have a tendency to be amongst the best and most memorable for the season they appear in. It’s also worth mentioning that Art of the Dress is a direct homage to Stephen Sondheim’s “Putting It Together“, and samples a decent amount from the song with minor tweaks (the two songs have to deal with very similar things as well). Just about anyone who’s attempted to put their creative streak into production can relate to Rarity’s dilemma in this episode, especially if they’ve ever attempted to work for friends or family. As someone who at one point was dipping my toes (rather unsuccessfully) into the field of graphic design, the concept of a client sending you back to the drawing board repeatedly asking for changes that you don’t necessarily think are for the better is not unfamiliar to me, and neither is the awkward stress that arises when said client is a friend that you’re working for as a favor. With so much of the fandom having some kind of creative outlet, I think Gerf hit it on the head that the extreme relatability of Rarity’s problem has a lot to do with why this episode is so well loved (and also why it won so many people over in regards to Rarity herself). In the same vein, the other five represent the absolute worst of what an artist can run into working with a client to varying degrees, from Twilight Sparkle’s micromanaging of every last detail, to Rainbow Dash’s insistence that things need to be changed without anything more than the most vague of indications of how to make it right, and the others falling somewhere in between. Of course, we do get the “20% cooler” line out of the bargain, which very quickly hit meme status and became massively iconic to Rainbow Dash as a character. 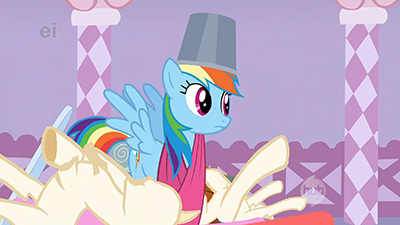 This episode also marks Vinyl Scratch’s first appearance, with her working the music at the first fashion show. It’ll be a while before we see her again, and most of her subsequent appearances have her doing pretty much what she’s doing here, but likely due to her unique punk/rave-ish appearance and the idea of there being a DJ pony, she very quickly became a fan favorite and is a staple of fandom works. As to the Rarity’s insistence on the dresses, I kind of see where you’re coming from, Noel, but to be fair she’s right in that the Gala is a formal attire event (although you wouldn’t necessarily know that prior to seeing it due to the extreme range of how each pony imagined the event in The Ticket Master). Applejack is also the only one who seemed at all resistant to the idea (interestingly enough Dashie doesn’t actually seem to be opposed to dressing up so long as she hits the appropriate level of “coolness” and isn’t made to stand still for long periods of time to model for it), and whether or not Rarity goes a touch further than she original stated (although that’s somewhat debatable, as apart from AJ’s hair being done for it her outfit consists simply of a fancied up saddle, boots and a hat, arguably holding true to Rarity’s promise to not go further than sprucing up her “work duds”), she does in the end respect her desire to keep the “frou frou” to a relative minimum. And she maintains the most important rule of being true to Applejack : don’t ditch the hat. A point I forgot to add was Opalescence, Rarity’s cat. It’s a nice addition, and I like how her snobbery is seemingly there to undercut Rarity’s own and make Rarity come off better in contrast, which is a nice narrative tool to slip in. And they don’t overuse Opal, either.